Although many things have changed at Holsinger&apos;s over the years, the traditions of the Holsinger Family have been passed down to its current sixth generation. 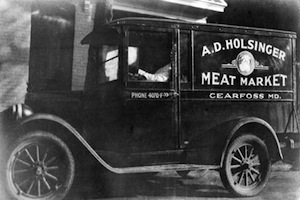 Having a complete line of fresh beef, pork, and poultry products, Holsinger&apos;s Meat Market also provides store-made Smokehouse Specialties including: Beef Jerky, Beef Snack Sticks, Smoked Bolognas, City Cured Hams, Hickory Smoked Bacon, Smoked Country Sausage, Polish Sausage, and Holsinger&apos;s Famous Hotdogs. Taste our Award-Winning Hotdog recipes including All Beef Hotdogs, Cheese Hotdogs, and Turkey Hotdogs. Ham lovers must try our own City Cured Ham, our ready-to-eat Baked Country Ham, and there&apos;s nothing like and Old-Fashioned Sugar Cured Country Ham. Holsinger&apos;s makes a wide variety of Fresh Sausages to satisfy every tastebud: Country Style, Maple, Apple, Sweet Italian, Hot Italian and Green Onion. For a low fat option try Holsinger&apos;s Turkey Sausage. Available at Holsinger&apos;s is America&apos;s Original Red Meat &apos;Buffalo.&apos; Lean and healthy, Buffalo meat is low in fat, calories, and cholesterol. We also stock fresh meat cuts and make a variety of smoked products that are out of this world. Holsinger&apos;s Meat Market serves Fresh Meatlover's Subs and a variety of Hot and Cold Sandwiches, Hot Soups and Boardwalk Style Fries all day long. Please check out our Deli Menu and place your order today. Holsinger&apos;s Meat Market also provides Custom Processing for Beef, Pork, and Wild Game Meat. Providing not only custom cutting and wrapping, but a wide variety of smoked products. Holsinger&apos;s Meat Market is located on the righthand side at 18006 Maugans Avenue.